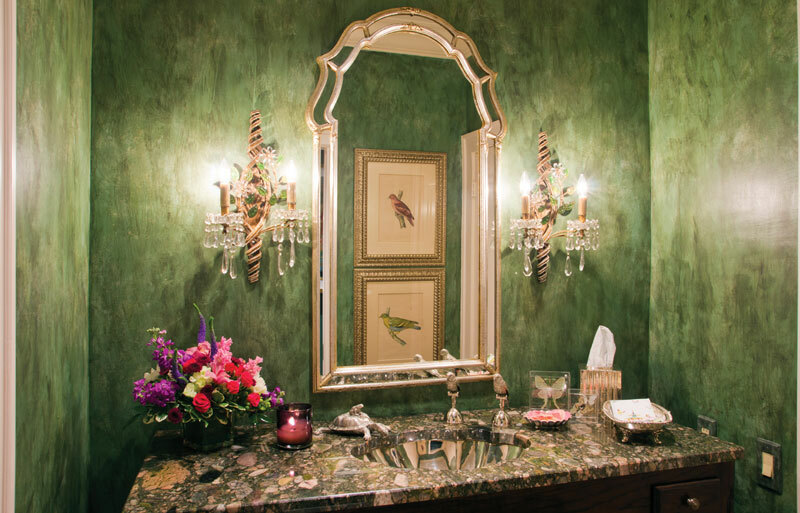 The Elm Creek garden home of Dr. Francisco and Graciela Cigarroa is a study in elegance. The large gas lamp by the entry gate hints at the Old World ambience within. Just beyond the gate is a large courtyard of sun and shadows with a fountain that plays its natural music day and night. 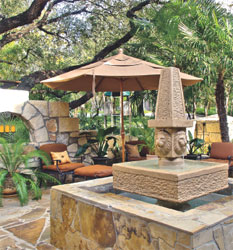 The Cigarroas designed the fountain and enjoy unwinding by its side at the end of the day. Private family time is important to them. Francisco is president of the University of Texas Health Science Center at San Antonio and is a nationally renowned pediatric and transplant surgeon. Graciela is a prominent San Antonio attorney who serves as chair-elect of the Mental Health Association of Texas and chairman of the UTHSCSA Premature Infant Development Program Advisory Board. She is co-chair of the UTHSC Council for Excellence in Women’s Health and is a board member of Family Violence Prevention Services and the Children’s Shelter. And that’s just the beginning of her volunteer activities. “And he wanted a gun cabinet,” Graciela says with a laugh. While he was busy at the Medical Center, Graciela worked with architect Charles Wilkes on designs for the triangular lot. The shape was a design challenge, but Wilkes was able to channel Graciela’s ideas into blueprints for a beautiful home. Graciela’s mother, Graciela Alarcon of Laredo, helped her with the interior design. “I was very lucky to have my mother help me with all the selections,” Graciela says. 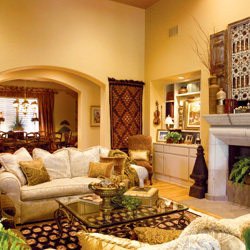 “She is renowned in Laredo for interior design and knew how to translate my ideas into selections for the house. My brother, Juan Carlos Alarcon, is owner of Candiles TA, which manufactures and imports the chandeliers and other lighting accessories we used in our house. Of course, my daughters had ideas, too. Everyone pitched in.” The great room flows from the courtyard. Four sets of French doors, imported from Mexico, form the front wall of the room and actually open into the courtyard, effectively doubling the living space. “We love to entertain, and opening these doors enables our guests to move more freely,” Graciela says. It also enables guests to easily reach the bar built into the back wall next to the courtyard. 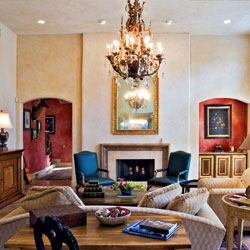 The comfortable chairs and sofa are sized to fit the room’s volume. The console and coffee table are Italian. The large mirror, while not an antique, could certainly pass for one. Large columns run from floor to ceiling in the entry, separating the great room from the dining area. Dark, heavy vigas serve as ceiling accents. “One of the things I like best about our home is that the corners are all round,” Graciela says. “It gives the rooms a softer look. We also used the same stucco on the inside of the house that we used outside, which seems to unite the areas into one space.” The spacious dining room is anchored by an impressive custom-made table and chairs that seat 10. The carpet beneath the table was a wedding gift. The side wall is painted with a mural titled in Latin words. “The words mean “He who lives well lives twice,'” Graciela says. “The muralist is from Mexico; he does a lot of work for my mother.” Double doors exit onto a small private patio. “This is still a work in progress,” Graciela says. “We’ve lived here 10 years, and we’re still not quite sure what we want to do with this space.” The doors between the dining room and the kitchen are actually giant shutters that can serve to isolate the kitchen activity from guests in the dining room. Most of the time, Graciela says, the doors remain open. “If I’m in the kitchen, I don’t want to miss out on what’s happening in the dining room,” she exclaims. The kitchen is a colorful room with faux-painted dome ceiling and cabinets. “I like the faux paint because it appears to stand up to wear and tear better,” Graciela explains. The tile backsplash runs around the country sink, which is surrounded by potted plants. 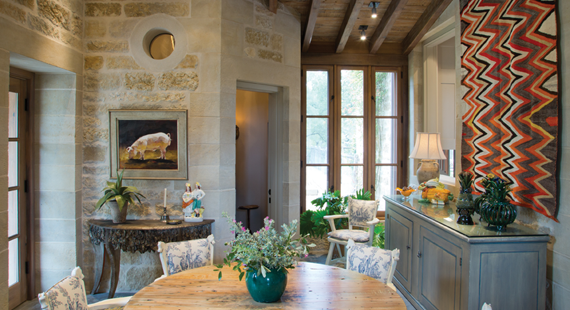 A plate rack displays Talavera dishware, and natural light filters through a skylight. Several rooster paintings by Parreche adorn the kitchen walls. The china cabinet is an old piece from Mexico. The kitchen table is surrounded by multicolored chairs. Graciela’s studio is sequestered off the great room. The terra-cotta walls are lined with pictures of Francisco playing his classical guitar. The computer on the desk and the paperwork surrounding it are a reminder that this is a working office. The master bedroom features a large salmon-colored armoire, which contains the television. Tall windows present a view of the backyard and swimming pool. A portrait of a mother and child hangs in the room, commemorating Graciela’s receipt of Avance’s 2006 Mother of the Year award.